Mayhew is an animal welfare charity working to improve the lives of dogs, cats and the people in our communities – at our Home in London and internationally. We take a realistic view of the - often difficult - situations we face. We look for ways to reduce the number of animals in need through pro-active community initiatives and preventative veterinary care. We know that a major part of our work is in understanding the links between social issues and animal welfare. We do not judge. We listen. We value people too. A society where people understand the importance and value of animal welfare. To promote animal welfare by delivering a broad range of community-based veterinary, care and education services in the UK and overseas. Helping the people in our community through a number of unique programmes. Helping dogs and cats find new forever homes. Providing preventative veterinary support to those in need. Managing rabies and dog population as well as educating overseas. We are entirely funded by public donations. It costs over £6,000 a day to run Mayhew. We can care for 30 dogs and 150 cats at any one time. We offer free and low-cost neutering, microchipping and vaccinations. Find out what our teams have achieved in the last year. Get to know the people behind Mayhew. Meet the celeb ambassadors who support our work. We remain open throughout World War II offering refuge to desperate homeless animals and owners. We expand our veterinary services and employ vets on-site. Mayhew International starts working in Moscow, and convinces the authorities to stop their ‘catch and kill’ policy for street dogs with a move towards spay and neuter projects. TheraPaws initiative launches. Volunteers and their dogs visit care homes and the elderly. Renamed ‘The Mayhew Animal Home’ in honour of our first superintendent, Anne Mayhew. 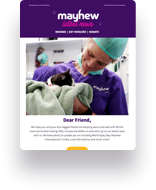 Twelve Mayhew team members care for more than 13,000 in a single year. We develop the ‘Animal Welfare Officer’ concept to work out in the local communities providing support and advice to both animal and owner. This includes the London homeless. Mayhew International starts working with HOPE & Animal Trust in Ranchi, India, supporting an Animal Birth Control programme and temporary shelter for street dogs. Our international team convince the government to stop poisoning dogs in Kabul, Afghanistan.